Well what can I say about the Ranch? I can tell you one thing for sure, The Ranch is an amazing place. 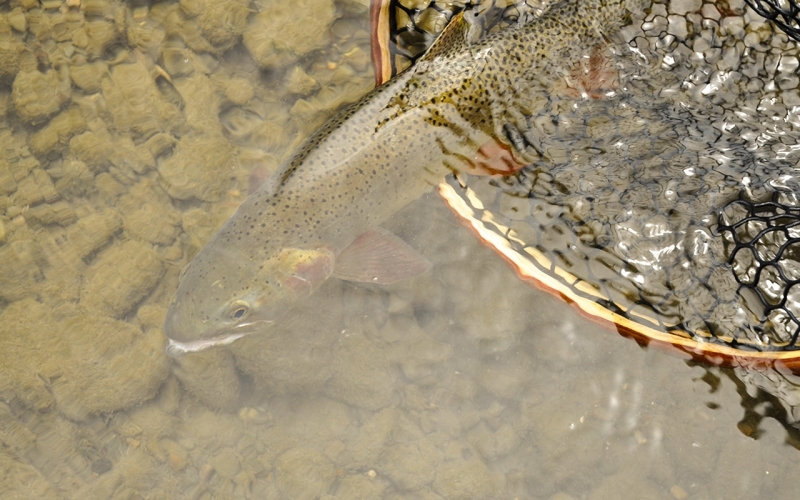 Take a walk in the Ranch and you will see pods of large trout up sipping Blue Wing Olives. The hatches of Blue Wing have been incredible. The key with that hatch is to get a large trout to pick your fly out of the thousands of naturals that are going over his head. Unfortunately I don’t have a solid answer for that issue. I do have some ideas, and sometimes they work and most of the time they don’t! Trick #1 un-match the hatch. The Blue Wings are a #20 so try tying on a #12 Renegade. Trick #2 sometimes these large Ranch fish get in a feeding rhythm, in this case I am not sure the pattern is that important. Try to time your offering with the rise. Trick #3 change your fly patterns often until you find something that is working, on the Ranch “working” means that you may only trick one in five but that’s better than nothing! Trick #4 try a drag free drift! Don’t take me wrong on that, I am not trying to sound condescending, but a drag free drift is the key to everything! One way to help combat drag is of course mend your fly line and using a long leader. When on the Ranch myself I start with Rio’s 12’ Power-Flex leader. I will often times tie on a foot or two of tippet as well so I end up with 15 feet of leader. Check your leader and fly frequently and clean off any salad that always finds a way to attach to your fly or your knots! Lastly enjoy yourself! 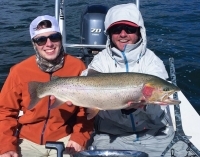 If you take a beating in the Ranch its ok. As far as I am concerned taking a few beatings in the Ranch is a rite of passage, and if so, you’ve fallen in with some of the best fly-fisher folks to have ever held a fly rod. 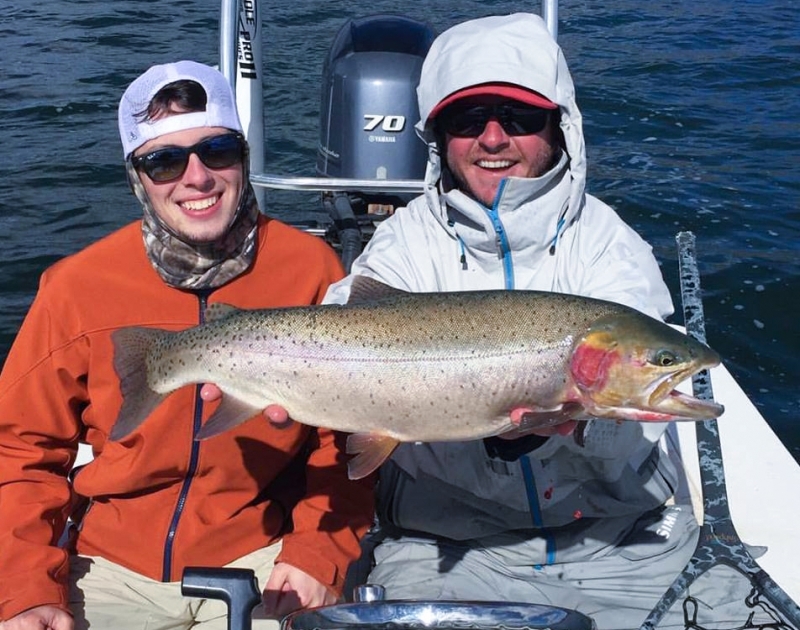 Tip your hat to the trout and tip your hat to the Harriman’s for giving all of us the opportunity to fish to the greatest trout in the world! I will be honest with you, not much has changed in the box. The flows are at 199 cfs and it would not be a good idea to try a float. I have noticed most folks have been fishing right at the dam. Keep in mind that there are some access points along the rim and also a great trail that has many access points. I like to park at the campground and fish up river. As far as patterns use smaller beads heads. I like Zebra Midges in a #18. Experiment with colors and leader lengths. Focus on the runs and in the deeper holes. 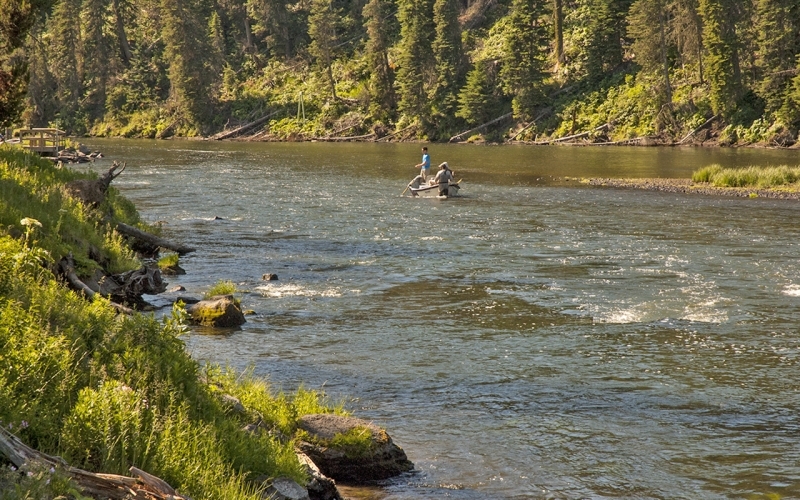 I reported last week that the Henry’s Fork from Ashton on down is fishing better than it has been all season. The same hold true for this week. The Blue Wing Olives continue to be on the menu and there are lots of Trout looking up. I really like the #16 Para-Wulff with a #18 brown or black Zebra Midge dropped about 4 feet below it. I would keep a sharp eye out for big Brown Trout to start becoming very aggressive as they near their spawning time. Also it’s getting to be the time of the year that we all need to watch for spawning areas. For those who don’t know what a spawning red looks like, when you see a “shiny spot” or an area of gravel that looks clean and will be about the size of a table top then that is most likely a spawning bed. Check one out but don’t walk through them or disturb them in any way. Remember those eggs are the future. As always don’t forget streamers! Again I just don’t have much in the way of new information for the Teton. Smaller Beads and streamers. Also Blue Wing Olives will come in very handy. As with all our area rives don’t let the weather scare you off the water. It seem that the worse the weather the happier the Blue Wings are! They are a hearty may fly! I have also noticed good numbers of October Caddis fluttering around. I will tell you that I have never had an amazing day fishing October Caddis on the surface but I have done very well swinging large Prince Nymphs off the bottom. The South Fork has come down 4560 cfs. Keep the flows in mind this time of the year. If you’re planning on doing the Conant to Byington stretch stay moving. Also make sure your prepared for just about any weather conditions, don’t get caught half way through the canyon and not have the right gear to keep you warm. Again small beads and streamers. 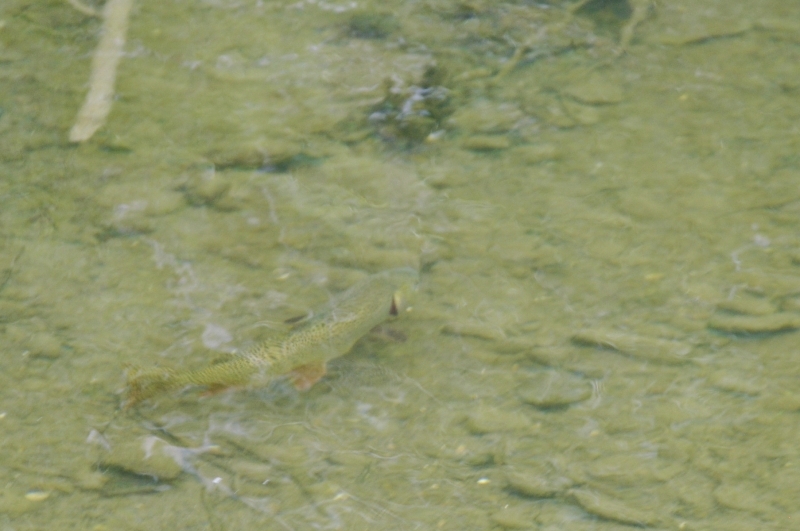 Take your time through the riffles and really watch for subtle eats. These fish will come into very shallow water to take Blue Wings off the surface. The Madison has fished well this week but once again it’s a small bead head game. The water between the lakes has been seeing the most pressure and I have not heard of any tanker Brown Trout being landed yet but I can guarantee you that they are there! The Blue Wing Olives have been hatching so watch for noses in the usual spots. I would again go armed with a good selection of streamers. Fall in the park is just what you would expect. 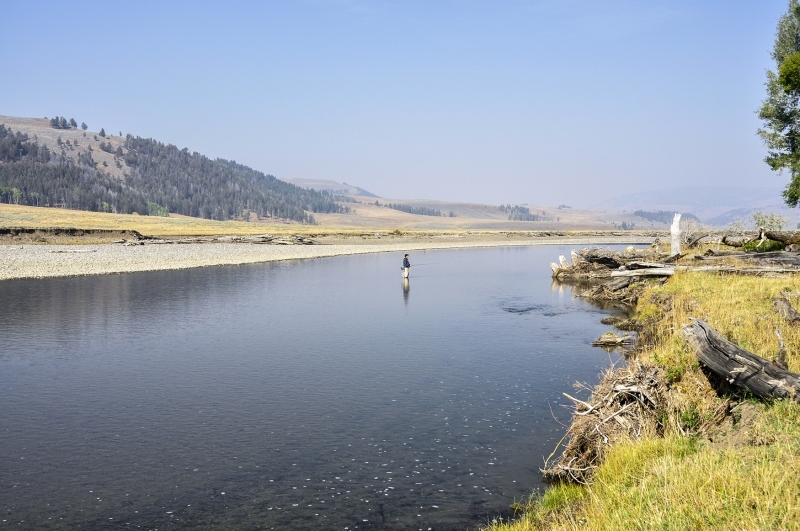 The fishing is amazing and the number of folks fishing the Madison in the park is also nothing short of amazing! The Madison in the park holds a special place in my heart. 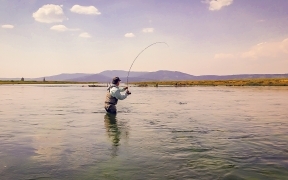 This summer I watched as my 10 year old boy Grayson Lanning take my fly rod from me and wade out to a riffle mid river. He approached the riffle from above and started to swing a soft hackle right through the bucket. I remember seeing the concentration on his face as made his next cast, he swung his soft hackle again and just like clockwork he was hooked up! He did it all on his own and I don’t think I have ever been more proud! It was a very special moment that I will remember forever and I hope he will to. Now if I can just get him to quit throwing sticks or chasing Brown Drakes around in the Ranch water! If you want to avoid the crowds I would suggest the Gibbon or the fire hole where you may have to do a bit of walking to get to the river. Once again Blue Wing Olives will do the trick. Henry’s Lake is the place to be right now. Look for large numbers of Hybrids around the state boat ramp. If you want to avoid the crowds than head on up to the county boat ramp and try to target large Brooke Trout that have spawning on the brain. I would have Leech patterns in different colors and also beads nymphs. I really like to fish Pheasant Tails and Scud patterns on Henry’s Lake.